Drone photography: If you’re not against it because of the Constitution, you’re against it because of how over-hyped it is. But in the hands of enterprising architecture fans, unmanned airborne cameras are also letting us explore some of the most important structures ever built from entirely new angles. Today, it's Paris’ 1897 glass-and-steel icon, the Grand Palais. 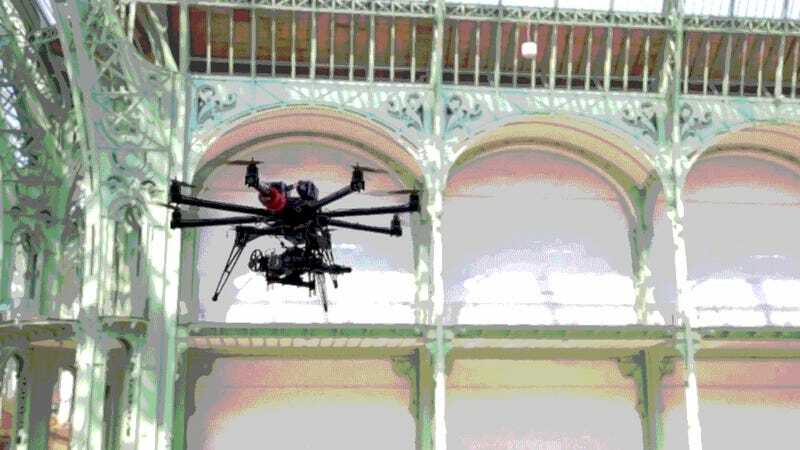 This week Et Alors, a French production company that specializes in UAVs, strapped a Canon D5 (we think) to a octocopter and set it free inside of Paris’ legendary, rapidly decaying Beaux-Arts masterpiece. It’s an incredible video—and not only because of the three-axis stabilized footage (which is so smooth it almost looks fake). The 116-year-old building, which was built to house the 1890 World's Fair, dwarfs everything around it; in fact, it’s still the largest glass-and-steel building ever built. Its glass vaults reach 150 feet above the ground floor, necessary to light the exhibitions and events below in an age just before electricity (and semi-plagiarized from London’s Crystal Palace). No one—except for the 1890s construction workers who installed it—has ever been able to look down on the Palais floor from its ceiling. So an emergent technology from this century is helping us explore a building designed to showcase cutting-edge technology from the last. When the Grand Palais made its debut at the 1890 World’s Fair, one of the most popular exhibits inside its walls showcased another cutting-edge photography technique: the panorama. Wonder how photographers of the day would react to this century’s latest trend?